From the Daily News Record online. This paper started to add local news in Spanish. According to this letter, the reader's first reaction was "this is great", swiftly followed by "I noticed that there were many grammatical errors. My first language is Spanish and I found it difficult to read." I find this very typical: companies realizing they need their material translated, but then not bothering to have it done properly - whether because of a desire to spend as little as possible (with predictable consequences), or because they really don't know how or where to get a professionally done translation. I think that our professional associations (but also us, as professional translators) should be much more active in communicating what professional translation is and why it is so important to get it done right. 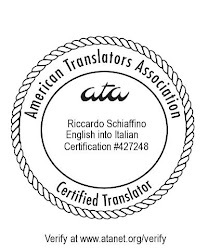 You right that people and businesses should understand the importance of using a professional translation service for documents to be published for a foreign audience, but speaking from experience, it's very difficult to make those in charge understand the value of such services, especially since when it comes down to their bottom line.